Of our remaining 6, 4 are division games and the other 2 are against extremely tough opponents. You could make the argument that the remaining road is officially the hardest. It'll also be tough to keep winning as we know. That never gets any easier. But 9-1! Who'd believe it after such a pitiful loss to the Bucs and a basically-loss to Cleveland? I have to be honest, I go into every week expecting the let-downs that have become the norm for us over the past 5 years and they just don't happen. We get stronger and more confident. Atlanta plays us close and Carolina might claw one or both away from us but I bet we beat Dallas and Pit. We've got a great chance of 13-3 or worst case 12-4. Either of those should be enough for a bye week and a home game. Hurt his pride. The truth is that the Saints could have put up 60 in they wanted to yesterday. It was like the first play of the 4th quarter. I only consider the Pittsburgh team difficult between them and Dallas, but Pittsburgh will be at the Dome. 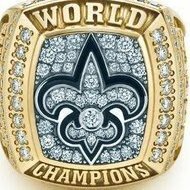 I honestly think the Saints could finish 15-1... 14-2 if St. Louis loses a 2nd game before our season finale and we are sitting at 14-1. What year do you think it is ravey? I'm the same way. Keep waiting on the let down game that hasn't happened yet. It's been the norm for this team every year since 2011. As tough as our schedule is, I just can't believe we're going 15-1. Someone will catch us on bad day. What you mean? The Rams if they win tonight only have one other possible upset which is @Chicago so they could easily make it to 15-1 as well. Neither can I but man do I want to! Truth is, I don't see who beats the Rams now (post-KC win) so I expect the road to LIII goes through their house. Their schedule is a good representation of why the AFC hates New England - soft division means easy wins down the stretch. We've been money on the road, though. I wouldn't want to play us right now no matter the venue. I should've wrapped this up in the other reply. S'what I get for starting to type before I've sipped coffee. I blame only myself. I believe!! But man look at the schedule! Two Car games left, 1 Atl. I'm much more confident in the non-division games cause we've been embarrassing teams here of late. If we need the Pit game, we'll take it. That whole competitive division thing is a huge chore, though. It never gets any easier, we just gotta keep winning. that sums up this offense well. brb gotta change my pants.